People’s mode of expressing displeasure varies. Such mode includes strike, protest or legal action. For Olusegun Obasanjo, Nigeria’s former Head-of-State and ex-President, his most preferred mode of expressing displeasure is writing letters. In a 4007 words letter titled ‘Points for Concern and Action’, Obasanjo, on 20 January, 2019 leveled grievous allegations of maladministration and misconduct against President Muhammadu Buhari. This letter, coming less than a month to the presidential election, has stirred the hornet’s nest; drawing condemnation and commendation from the pro and anti Buhari factions. This piece sets sight on assessing the veracity of Obasanjo’s allegations and his moral eligibility to write. Obasanjo’s Points of Concern and Action comes in 48 paragraphs. In sequence, the issues raised in the letter are: the Independent National Electoral Commission (INEC) and government’s unwillingness to conduct transparent elections (Par. 1-11); vote-buying through Trader Moni (Par. 12-16); the controversial appointment of Amina Zakari as Head of INEC’s Collation Centre (Par. 17-20); harassment of the judiciary and the politically influenced arraignment of Justice Walter Onnoghen (Par. 21-24); Buhari’s inability to continue ruling and why Nigerians should not reelect him (Par. 25-29); Buhari and Abacha’s governing similarity and the plot to rig the 2019 polls (par. 30-37); readiness for probe (par. 38-39); appeal to desist from desperation and manipulation (Par. 40-44); and the call for improved security and decimation of Boko Haram (par. 45-48). These issues and allegations would be examined and supported, or refuted, by facts. Obasanjo opines that INEC is aiding Buhari’s reelection and unwilling to conduct free, fair and credible polls (Par. 1-11). This concern is fueled by the hyper-cordial relationship and the alleged secret meetings between INEC and the executive arm of government. Nonetheless, discrediting the electoral process and propagating unsubstantiated infractions are unnecessary, though many are worried that INEC and police misconduct at the Osun governorship election may be repeated in favor of Buhari. The Buhari administration may likely ensure the election is declared inconclusive, if early result shows the President is losing. Obasanjo expressed his rigging concern (in par. 1-11) without recommending how electoral fraud can be abated. This he later did in paragraph 20 where he recommends the use of only card readers for voter accreditation, and the provision of a secured and credible means of identifying party agents and coordinators. In addition, INEC needs to checkmate the prevalence of vote-buying and harassment of voters by the security agents and thugs loyal to the ruling party. Obasanjo’s call on the international community to observe the polls and sanction electoral offenders is a reflection our political immaturity. Developed nations run their affairs and conduct credible elections without inviting us, but we rush to them at every slight provocation or need. Obasanjo, in paragraph 17 and 18, berates INEC for assigning key election planning and coordination roles to Amina Zakari, based on her alleged closeness to Buhari. The former President also doubt Zakari’s ability to operate impartially as the head of the result collation center. INEC could have avoid the backlash by appointing another competent person instead of Zakari. Insisting on Zakari is a recipe for crisis. If any irregularity occurs during collation, most Nigerians would believe it’s her plan work to manipulate the result. For example, if internet or electricity goes off during collation due to technical errors, Nigerians would conclude that she intentionally disrupt the process in order to rig in Buhari. Obasanjo accused Buhari of incompetence, divisiveness, nepotism, condoning corruption, and vote-buying (Par. 12-16). He also criticized Vice President Yemi Osinbajo for embracing wrongs despite being a pastor and law professor. One cannot really blame Osinbajo since Buhari calls the shot. The comfort of the office Osinbajo occupies has also diminished his moral and spiritual principles. He has depth his feet into the murky waters of politics, validating the popular assertion that a lamb fraternizing with a dog will surely eat feces. Obasanjo is right that Buhari is condoning corruption, especially among his party men and loyalists. Opposition figures are hurriedly arraigned while members of the ruling party accused of corruption are either not prosecuted or their trials stalled. Babachir Lawal, Goodswill Akpabio and Orji Uzor Kalu are beneficiaries of Buhari’s double standard. Obabsanjo’s claim that Buhari is nepotistic is also true. Most crucial positions – especially the heads of security agencies – are being occupied by Buhari’s ethnic men. Timing truly discredits the significance of Trader Moni – a N10,000 ($28) business development aid for petty traders. The implementation of the scheme when election is fast approaching makes people misinterpret the noble idea as a means of inducing the largely populated poor and vulnerable to vote Buhari. Obasanjo accused Buhari of destabilizing the judiciary to install his loyalist, in order to avoid being sacked by the post-election tribunal because he plans to rig the presidential election (par. 21-24). The swiftness of Chief Justice Onnoghen’s arraignment three days after a petition was submitted against him is a pointer that his trial was purposely to achieve a desired political aim – his removal. It is unfortunate that the anti-graft agencies do not swiftly file charges when petitions are submitted against Buhari’s henchmen. On 25 January, 2019, Obasanjo’s allegation came out true as Buhari suspended Chief Justice Walter Onnoghen based on an arranged order from the Code of Conduct Tribunal (CCT). Onnoghen’s suspension may destabilize the polity. His ordeal is widely construed as persecution and a ploy by the northern political actors to relegate the south. Onnoghen is from the oil rich Niger-Delta region where the fund that sustains Nigeria’s economy is being generated. His removal may resurrect the hostility and militancy against oil explorations in the Niger Delta. Obasanjo chastised Buhari and urged Nigerians not to reelect him based on his improper character and attitude, impunity, lies, intolerance and dictatorship (par. 25-29). Apparently responding to allegations that he squandered $16billion without providing power, the ex-President penned that “even when figures, facts and statistics are made clear to Buhari, he keeps repeating what is untrue, either because he cannot understand or for mischief purposes and that places him on the level of a pathological liar” (par. 27). Obasanjo likened Buhari to late dictator Sanni Abacha and re-accuse him of desperately planning to rig the presidential election (Par. 30-37). If this allegation is logically examined, Buhari is not totally Abacha, but there’s a bit of Abacha in him based on his intolerance to anyone or anything (perceived to be) against him. His ruling style has really shown that “you must go along with him or be destroyed”. The persecution of Senate President Bukola Saraki, Senator Dino Melaye and Deji Adeyanju gives credence to Obasanjo’s allegation. Unafraid, the ex-President warned Buhari’s men to stop threatening him with arrest as he is ready to be probed (par. 39). While Buhari is somewhat becoming dictatorial and desperate, publicly stating that his henchmen are strategizing to maim, torture and kill on his order and in his interest, even if true, is unnecessary as such could heat up the polity. Such concern should have been communicated privately to other statesmen or discussed at the Council of State meeting. Many expect Obasanjo to show more maturity on sensitive matters being a former President, elder statesman and opinion molder. Obasanjo’s allegation that Buhari’s henchmen are planning to rig can’t be utterly discarded, considering the electoral fraud the team allegedly committed during the Osun governorship and rerun elections. Be that as it may, in politics, crying wolf is a practical way of preventing the expected and suspected from happening. It is also a means of debasing opponents in developing democracies such as ours. Buhari’s winning prospect, despite his many flaws, is frightening Obasanjo and the opposition People’s Democratic Party (PDP). This makes them raise false alarms and unsubstantiated allegations. Moreso, Bola Tinubu’s political clout and appointment as Chairman of the ruling All Progressives Congress Campaign Council is troubling the opposition, especially the PDP. Tinubu doesn’t believe in losing. He plays to win and has virtually always won by hook or by crook. Tinubu’s interest in the 2023 Presidency is making him do all in his capacity to make sure Buhari wins, not minding that he was sidelined after Buhari won in 2015. Obasanjo advise Buhari not to allow desperation push him into manipulation. He further urge him to peacefully relinquish power if he lose (par. 40-44). The forthcoming election is an integrity test for Buhari. The struggle for power is intense and people are now politically conscious, such that any obvious electoral fraud may set Nigeria ablaze. Buhari would have to, or be forced to, step aside if he is defeated. The election should be free, fair and credible enough that the opposition would gracefully throw in the towel, if Buhari wins. Obasanjo decries the alarming insecurity and calls for improved regional cooperation to prevent Boko Haram and Islamic State insurgents from further gaining ground in Nigeria and Africa (par. 45-48). As being orated by most Nigerians, Obasanjo contends that the resurgence of Boko Haram attacks and widespread insecurity across the country is “partly due to the misuse of the security apparatus and poor equipment deployment, coordination and cooperation”. Is Obasanjo’s accusations a means to an end – probably to reduce Buhari’s electoral value – or a patriot’s clarion call for change? Themes and recurring words unveil Obasanjo’s interest and the main purpose of writing the open letter. Paragraph 1-11, 17-20, 30-36, 41-43 mainly focus on issues pertaining to campaigns, preparation and conduct of the forthcoming elections. 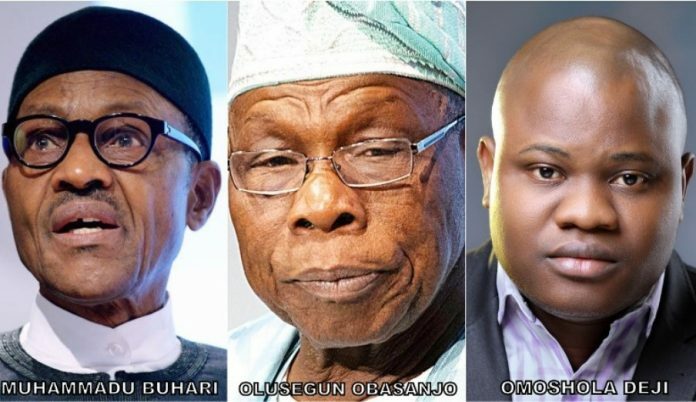 Dedicating 25 out of 48 paragraphs to election issues is a clear indication that Obasanjo’s main purpose of writing the letter is the conduct and outcome of the 2019 Presidential election. Top on Obasanjo’s mind is the stability of Nigeria. ‘Nigeria’ is the most used word in the letter, as it appears 51 times. Then comes ‘Buhari’, which appeared 31 times. ‘INEC’ thirds the ‘Points for Concern and Action’ recurring words table by appearing 29 times. Obasanjo is strongly convinced that Buhari is a living Abacha. The late, former Head-of-State’s name (Abacha) is the fourth most used word in the piece as it appears 13 times. ‘Security’ appeared 9 times, ‘Boko Haram’ appeared 5 times, and ‘kidnapping’ appeared only once. The three words are interconnected and is themed ‘Obasanjo’s concern on insecurity’. A summation of the three words count (9+5+1=15times) is not up to the times ‘Buhari’ (31) and ‘INEC’ (29) appeared in the letter. This implies that Buhari and INEC’s conduct are of more concern to Obasanjo than the insecurity ravaging the country. The word ‘economy’ is conspicuously absent in the letter. A point of concern raised that’s partly related to the economy is the condemnation of the N10,000 Trader Moni handout to petty traders by Vice-President Yemi Osinbajo. ‘Osinbajo’ was only mentioned 6 times in the letter. Obasanjo goes spiritual as ‘God’ was mentioned 11 times. Judiciary and justice surfaced 4 and 3 times respectively. Obasanjo’s moral eligibility to criticize Buhari is a figure 6 placed between two persons sitting opposite each other. One is bound to see the figure as 6, while the other would definitely see the figure as 9. To the person seeing figure 6, Obasanjo has no moral right to criticize Buhari as he rebukes people for offenses he is also guilty of. Obasanjo who calls Buhari a dictator is even more dictatorial than Buhari. During his reign from 1999-2007, he masterminded the removal of Senate Presidents, declared state-of-emergency whenever he wish; ordered the Odi massacre; forcefully removed Rasheed Ladoja as Oyo State Governor; backed the unjust removal of then Governor Ayo Fayose in Ekiti State; and seized Lagos State Government’s allocation despite a Supreme Court judgment against such action. The same Obasanjo that is criticizing Buhari failed to honor MKO Abiola, despite being the major beneficiary of his election annulment and death. The Buhari that Obasanjo is condemning did the needful by posthumously honoring Abiola and declaring June 12 as Democracy day. Obasanjo who is urging Buhari not to seek reelection did two terms and even tried to grab a third, but failed. All these antecedents of Obasanjo deny him the moral right to criticize Buhari. But then again, to the person seeing the figure as 9, the most eligible person to correct someone threading the path of failure is someone who has failed. An emerging prostitute is best advised and rebuked by a harlot living with Acquired Immunodeficiency Syndrome (AIDS). A smoker is best advised by a chain smoker that has contracted lung cancer. In Nigeria today, the most qualified person to advise Buhari is Obasanjo. His political track record earns him the eligibility. Obasanjo is the only living being that pairs with Buhari. Obasanjo ruled as Head-of-State from 1976 to 1979 and was later elected to rule as President from 1999 to 2007. Buhari also ruled as Head-of-State from 1983 to 1985 and was later elected President in 2015. Many ex-Presidents, former Head-of-State and retired Army Generals are involved in partisan politics, but none has ruled the nation dictatorially and democratically except Obasanjo and Buhari. Nigerians thus need to look at Obasanjo’s message and not his moral eligibility. Moreover, he who support has the right to criticize. Obasanjo was instrumental to Buhari’s victory in 2015. Obasanjo may be unworthy, but his letter contains salient issues that are truly worthy of concern and action. The political, unjust removal of Chief Justice Walter Onnoghen is one of such.